A blog that records the activities of HOPE Pakistan..
June 18th,2014. It was a historic day for the young students of Target sponsored HOPEan NGO in Pakistan, home schools located at Rehri Goth, the outer, eastern periphery of the sprawling city of Karachi. About an hour's drive from the city centre but a world removed for the students of Rehri Goth. The students totaling exactly 100, never in their wildest dreams ever visualized going to the Karachi Zoo ~ and their happiness knew no bounds when they were told of the anticipated trip. HOPE, an educational NGO in Pakistan arranged two buses, made reservations at the zoo, arranged for refreshments and meals for the students and the organizers and gave strict instructions to work within a timeline so that they could return back to Rehri Goth within daylight hours and be collected by their parents or a responsible next of kin. It all began with the children boarding the buses at 10.00 am. The journey to the western part of the city was tedious, coping with the last of the morning rush hour of a work-day morning. But it was worth it for the children. When they stepped out of the bus, they stepped into a different world. The teachers and organizers guided them from one point to the other but they were awe-struck seeing so many different live animals at such a close range, And it was difficult to get them moving from one cage to the other, Their special interest was in the big cats, lions, tigers and leopards ~ and of course the monkeys, who gave the children a special performance of their antics and kept them laughing long after they had moved on. A train ride that circles the zoo was arranged for the students, which they thoroughly enjoyed. Then, it was time for a break for an enjoyable meal under the shady trees of the zoo. Everyone smiled and talked excitedly of all the animals they had seen. After the break, the last of the animals were visited, like the elephants and the crocodiles, and then, it was time to board the buses again and head back home to Rehri Goth. Dr. Mubina Agboatwalla, child specialist in Karachi was happy that the expedition was very successful and worked within the time-frame. Dr. Mubina Agboatwalla, child specialist in Karachi is of the view that such activities are necessary for children’s upbringing. The students reached their respective schools at Rehri Goth for collection by their parents etc. It was a long day and the children were a little tired ~ but it was a day they would remember for a long, long time. Pakistan is a country where the disparity level between the lower middle class and the middle class is very high. Also, the population living below the poverty line is increasing day by day. We at HOPE, an educational NGO in Pakistan, have been working towards a variety of causes one of which is helping families living in squalor. Recently, HOPE team went to a place called Bhains Colony (Cattle Colony) where they gave in-kind donation to a girl called Shehzadi. Shehzadi is a pretty girl of a lower middle class family. Her mother and father work hard for a living to sustain a family of eight individuals. Shehzadi is getting married soon and being the eldest she was worried whether her parents will be able to bear the burden of her wedding expenses. HOPE managed to buy some essential items for Shehzadi’s wedding which is due this week. Shehzadi’s parents were over the moon when they saw HOPE’s team bringing gifts for Shehzadi which would lessen their burden. 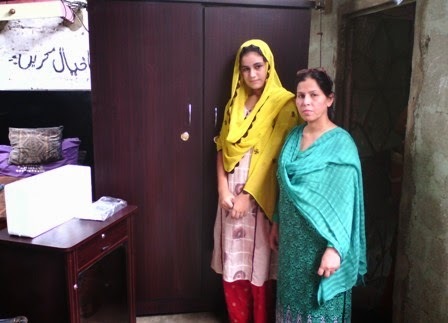 Shehzadi’s parents thanked HOPE’s staff for being there with them at this hour of need. Dr. MubinaAgboatwalla, child specialist in Karachi has been helping the needy for the past 18 years through HOPE, an NGO in Pakistan. HOPE an educational NGO inPakistan, is operating schools and hospitals all over Pakistan providing free of cost education and health facilities to the less fortunate of our country. She is of the opinion that each and every organization, companies, individual who have the capacity, whether monetary or in-kind, should come forward to help the undeserved. It is the civil society which has a huge role in bringing prosperity to this country and we at HOPE, an NGO in Pakistan are striving hard to bring about a positive change towards achieving a better Pakistan.